Disco Donnie Presents continues the tradition of bringing a massive Halloween themed festival to Texas with the announcement of the inaugural Freaky Deaky festival at the Sam Houston Race Park in northwest Houston on October 27th & 28th. 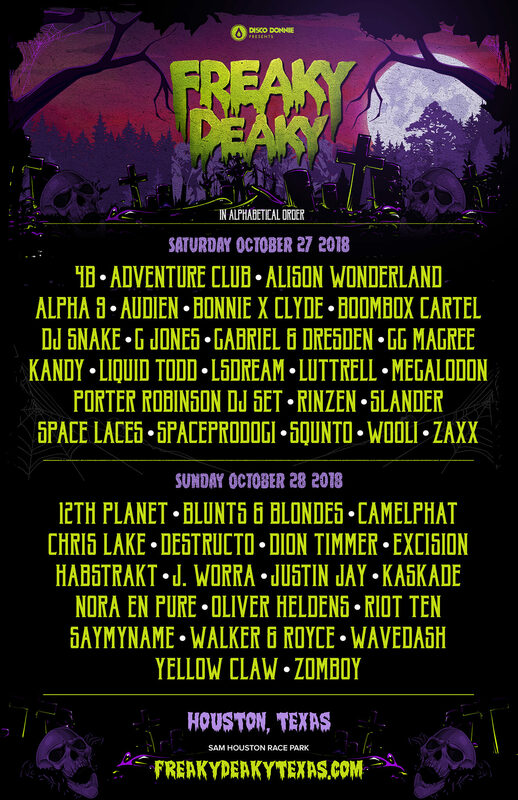 With over forty artists booked across three stages, only time will tell what other crazy surprises Freaky Deaky Texas will have in store. For now, we’ve been blessed with Saturday and Sunday lineups which include headlining acts such as Saturday’s DJ Snake and Porter Robinson (DJ Set), and Sunday’s Excision and Kaskade. Take a close look at the full lineup below to make sure you’re not missing out on anyone! Tickets for Freaky Deaky Texas are selling like hot cakes so get them fast! Early bird tickets sold out in less than 24 hours and over 20,000 tickets are now sold. Single day, 2-day GA, and 2-day VIP tickets are now on sale HERE along with payment plans and travel packages. Stay up to date and informed with these outlets!